Pope Saint Marcellinus was the bishop of Rome beginning c. 296 until his death in c. 304 C.E. Although the majority of his pontificate was peaceful, his reign is particularly controversial, because he is believed by many to have committed the sin of apostasy while pope. Several sources indicated that Marcellinus sacrificed to pagan idols during the persecution of Emperor Diocletian, and only became a martyr after his conscience moved him to recant his apostasy. 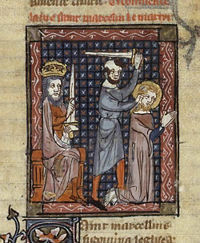 Modern Catholic authorities dispute that Marcellinus succumbed to temptation under persecution, although for centuries his biography accepted the tradition that he indeed did so but had repented of his sin and redeemed himself by becoming a martyr. This feast of Pope Saint Marcellinus is on April 26. Little is known of Macellinus' history before he become pope. According to the Liber Pontificalis, he was a Roman citizen, the son of a certain Projectus. The Liberian Catalogue of popes gives June 30 as the day of his election, and the years 296-304 as the time of his pontificate. Marcellinus’ pontificate began at a time when Diocletian was Roman Emperor but had not yet started to persecute the Christians. The emperor thus left Christianity relatively free, and so the church’s membership and influence grew. Diocletian first moved against Christianity in the year 302. Christian soldiers in the Roman army were forced to resign, and later the Church's property was confiscated and Christian books were destroyed. After two fires in Diocletian’s palace were blamed on the Christians, the emperor took harder measures: Christians had either to apostatize, or they were sentenced to death. The emperor's anti-Christian edicts in Rome were executed by Caesar Maximian, causing great difficulties in the Roman Church after 303. 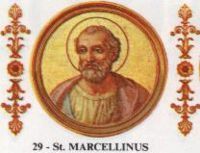 Marcellinus died in the second year of the persecution. Contemporary sources do not mention him as a martyr. His name does not occur either in the list of martyrs or even in the list of the bishops in the fourth-century Roman Chronograph. Neither is he mentioned in the "Martyrologium Hieronymianum." However, in speaking of Marcellinus, the church historian Eusebius uses an obscure but perhaps telling expression: He was "overtaken by the persecution" (Hist. Eccl. VII, 32). From this, it seems that Eusebius believed he did not suffer martyrdom, in which case a different expression would have been used. However, others clearly believed that he did die a martyr's death, but only after first apostatizing. Indeed, some scholars believe that the reason he is omitted from some lists of martyrs and bishops is that he was considered unworthy of either title, perhaps simply committing apostasy and never repenting. In this theory, he was later rehabilitated to the status of a pope who had lapsed but soon repented and was then martyred. From 299 to 302, Diocletian's primary residence was in Antioch, where he carried out a cruel persecution against Manichaenism. By the autumn of 302, he turned the power of his office against the Christians. Diocletian ordered that Deacon Romanus of Caesarea have his tongue removed for interrupting official sacrifices. Romanus was later put to death on November 17, 303. 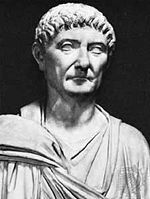 At first, Diocletian limited his general proscriptions against Christianity to the ranks of the military. However, after seeking the advice of the oracle of Apollo at Didyma, he decided on a universal persecution. On February 23, 303, Diocletian ordered that the newly built church at Nicomedia be razed. He also demanded that its scriptures be seized and burned, and that any precious items of the church be devoted to the state treasury. The next day, Diocletian's first Edict against the Christians was published. The order commanded the destruction of Christian scriptures and places of worship across the Empire and prohibited Christians from assembling for worship. Before the end of February, a fire destroyed part of the imperial palace. A second fire occurred 16 days after the first. Convinced that the culprits were Christians, Diocletian moved even more forcefully against the church until at least April 24, 303, when six individuals, including the bishop of Antioch, were decapitated. Antioch having become too unsafe in his opinion, Diocletian soon left the city for Rome. Further edicts followed, compelling the arrest of the Christian clergy and universal acts of pagan sacrifice to prove one's loyalty. Under the persecution of Diocletian, Marcellinus, the pope of Rome, was ordered to surrender the Scriptures, to sacrifice to the gods, and to offer incense—and he did. After his apostasy his conscience struck him mightily. He repented of his sin and confessed himself a Christian before the authorities. For this he was executed and crowned with the glory of martyrdom. His lapse and recovery show how God accepts repentance and how He exalts those who humble themselves before Him. The martyrdom of Pope Marcellinus. In the beginning of the fifth century, before the above-mentioned reports were published, Petilianus, the Donatist bishop of Constantine, Algeria, affirmed that Marcellinus and his priests had given up the holy books to the pagans during the persecution and offered incense to false gods. Saint Augustine of Hippo, a leading anti-Donatist, denied the affair. Documents dealing with the confiscation of the church buildings at Rome, brought forward by Augustine during the Donatist controversy in Africa, mention only two Roman deacons as traitors who collaborated with Rome. At the beginning of the sixth century, an apocryphal document appeared purporting to be the acts of the council of Sinuessa (located between Rome and Capua). This supposed synod of 300 bishops reportedly took place in 303 in order to inquire into the accusations against Marcellinus. On the first two days, Marcellinus had denied everything, but on the third day he admitted his lapse and repented. However, the synod passed no sentence on him, declaring itself incompetent to pass judgment on the Roman pontiff. When Diocletian learned of the decision, he had the pope and several bishops of this synod executed. However, historians almost unanimously agree that the "acts" of this council are forged. Another tradition holds that Marcellinus repented to an assembly of bishops at Campania: "The pope dressed in sackcloth poured ashes over his head and entered the assembly and, before all, confessed his sin begging them (the bishops) to judge him." Told that he should execute sentence on himself, Marcellinus stripped himself of the priesthood, declared that he should not be buried in holy ground, and returned to Diocletian to confess his faith in Christ, whereupon he was beheaded. His body lay unburied for 36 days. Saint Peter appeared to the new pope, Marcellus and ordered that the body of Marcellinus be buried, saying: "He who humbles himself shall be exalted." Modern Catholic tradition holds that "the pope did not comply with the imperial edict by any overt act, such as the surrender of the sacred writings, or even the offering of incense before the statue of a god." It is notable in his defense that neither Eusebius nor Theodoret mentions Marcellinus' alleged apostasy. On the other hand, it is remarkable, that in the Roman Chronograph whose first edition was in 336, the name of this pope alone is missing, while all other popes from Lucius I onwards are listed. If he was not martyred, then what did happen to Marcellinus? It is possible that he was able to hide himself in a safe place of concealment, as many other bishops did, and simply died of natural causes. But it is also possible that when the edict of outright persecution was issued, he somehow secured his own immunity—for instance through a bribe. In Roman Christian circles this would have been imputed to him as weakness, but not as apostasy; yet, his reputation would certainly have suffered from it. However, it is certain that his tomb was venerated by the Christians of Rome and that he was later recognized as a martyr. Marcellinus died in 304, but the day of his death is not certain. In the Liber Pontificalis, his burial is dated as April 26. This may be a mistake, but this date is retained in the historical martyrologies of the ninth century and—based on them—in the later martyrologies. If the date of his death were calculated from the duration of his office given in the Liberian Catalogue, he would have died on October 24 or 25, 304. His body was interred in the Catacomb of Priscilla on the Via Salaria, near the crypt of the martyr Saint Crescentius. During Marcellinus' pontificate, Armenia became the first Christian nation in 301. Some sources indicate that it was he who ordered the Catacomb of Callixtus filled with earth, to protect it from desecration. Neither Marcellinus' martyrdom nor his apostasy is an established historical fact. However, it seems clear that the Roman church suffered considerably after his death, as well as during the two years preceding it. After a considerable interregnum, he was succeeded by Pope Marcellus I, with whom he has sometimes been confused due to the similarity of their names. The period during which the papal throne was unoccupied casts doubt on the tradition holding that his body lay unburied for 36 days until Saint Peter appeared and ordered the new Pope Marcellus to bury him. The tomb of Marcellinus, however, was indeed venerated at an early date by the Christians of Rome. In one of the seventh century pilgrimage itineraries of the graves of the Roman martyrs (the Epitome de locis ss. martyrum) Marcellinus' grave is expressly mentioned among the sacred tombs of the Catacomb of Priscilla. In early twentieth century excavations at this catacomb identified both the burial chamber of Marcellinus and the crypt of Saint Crescentius, which lay beside it. However, no monument was discovered which referred to this pope. The fact that the author of the Liber Pontificalis used the lost martyrdom of Marcellinus, written probably in the fifth century, shows that he was honored as a martyr at that time. His name also appears in the martyrology of the Venerable Bede, although this writer apparently drew his account from the "Liber Pontificalis." This feast of Pope Saint Marcellinus is on April 26. The official Catholic account of his life, which for centuries followed the story in the "Liber Pontificalis" concerning his lapse and his repentance, were altered in 1883, removing the reference to his martyrdom as well. Another Marcellinus—a priest who died in the persecution at Rome in 304—still appears in current lists of Catholic martyrs. ↑ Catholic Encyclopedia, Pope St. Marcellinus. Retrieved July 4, 2008. Farley, Lawrence R. A Daily Calendar of Saints. Minneapolis: Light & Life Pub, 1997. ISBN 9781880971246. Marcellinus in the Catholic Encyclopedia. www.newadvent.org. This page was last modified on 16 September 2014, at 17:36.